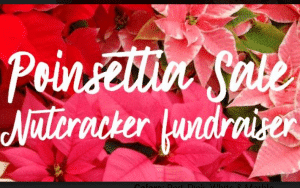 Time to order your poinsettias for this holiday season! All proceeds from this sale will go towards the Charleston Ballet’s upcoming NUTCRACKER production, scheduled for December 14-15, 2018 at the Clay Center! Orders are to be picked up on Tuesday, November 27th from 4-6 pm at the Virginian Building located at 814 Virginia St East.